Kootu Podi, this recipe is my Amma's recipe. I have been following this for the past 8 years and my Kootu has never failed to attract appreciation. It is a simple to make and easy to remember recipe. I always use a Tea Cup/Coffee Dabara to measure the quantities while making this Powder. This Stores well in Room Temperature,More than a month. The below given measurements will keep you going for a month. 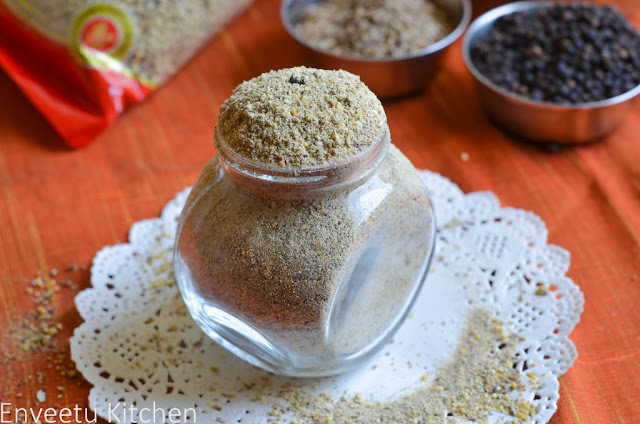 I use the same powder for my Rasam too, with a green chili added, it tastes great. Take all the given ingredients in a Mixer and Grind until almost fine. Dont Grind it too fine, a little coarse dal, adds a great texture and taste to the Kootu or Rasam. 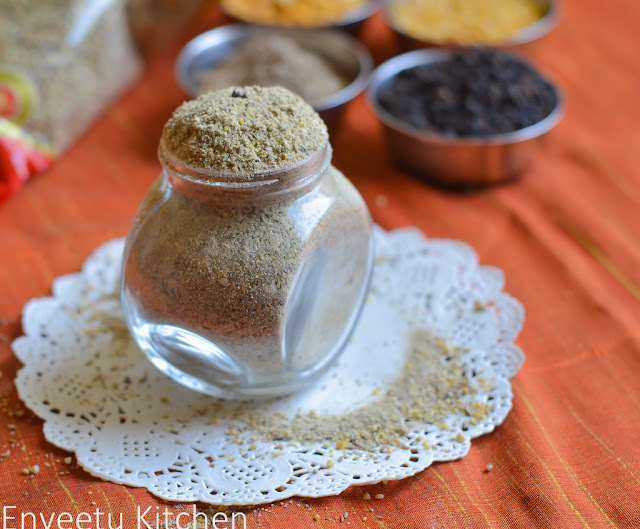 While using in Kootu, add 2 tsp of this spice mix, I have used the same Spice mix in Malabar Vellari Kootu Recipe. wooww.. tis will make life easier.. 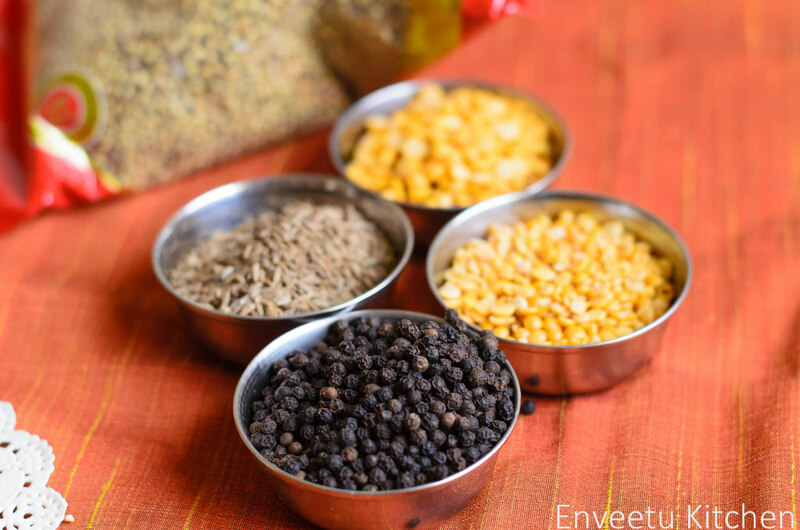 Mom's recipes always rock, we do make kootu podi but very rarely, mom used to add kopra thengai in her podi..Urs sounds easier than my mom as we dont kopra thengai here. Awesome clicks Dear ! Nice post ! Nice pics.These podis really save time during weekday mornings! nice picture... all my podi pictures are not so inviting.. should learn your skills!! 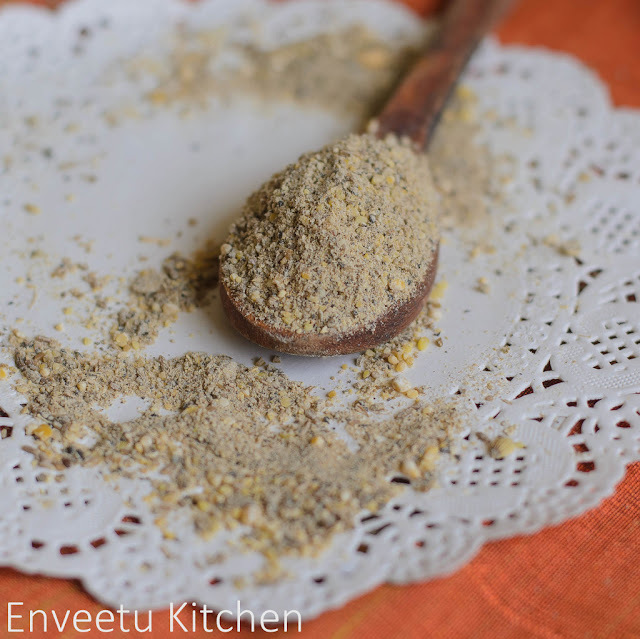 Very flavorful and peppery kootu podi! Interesting one we don't use podi for kootu. This is new for me. I usually wont make this in bunch but grind it when ever I prepare kootu!! love the fresh flavors of this spice. That's a very interesting and different spice powder. Addition of the different dals sounds delicious. Will try when I make kootu next time. nice layout Priya ! and although I grind fresh masala paste for kootu everytime, wudnt mind a lil jar handy like this ! !